This kit adds 4 amp battery charging to CE ('89) and newer 9.9, 15, 20, 25, and 30 Evinrude® and Johnson® manual start motors. Call out NUMBERS (1), (2), etc. in the text and illustrations refer ONLY to the specific items in the Contents of Kit illustration and list. Call out LETTERS (A), (B), are used over and over - on different items in other illustrations. Installation of this kit involves procedures that require special training for the installer. The installation may also require special tools, supplies and/or Service Manuals and other literature. Service Technicians at your Evinrude / Johnson Dealer have received special training and have the special tools, supplies, and reference literature to service this product. We recommend that you have this kit installed by your Evinrude / Johnson Dealer. To prevent accidental starting remove spark plug wires. Remove battery cable if installed. Remove flywheel. 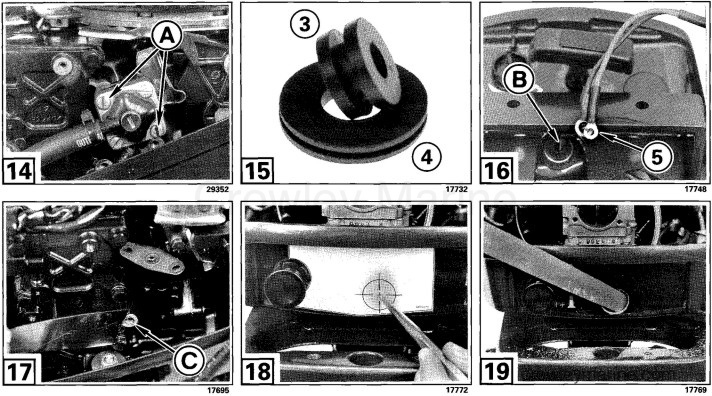 See Section 3 - Flywheel Servicing in Service Manual. Loosen ignition module screws, and remove screw (A). Discard spacer (B). Remove screws (C) and clamp (D). Loosen ignition plate screws until they are out of retainer plate. Turn over ignition plate and remove screw and retaining plate (A). Insert stator wires thru hole in ignition plate and position stator (1) on bosses. Loosely install stator screws (2) and ignition module screws (A). Position wires in a single row out thru notch in ignition plate. Reinstall clamp (B) and tighten screws. Position wires (and spiral wrap) in groove in underside of ignition plate and install retainer plate (C) with tab (D) in notch. 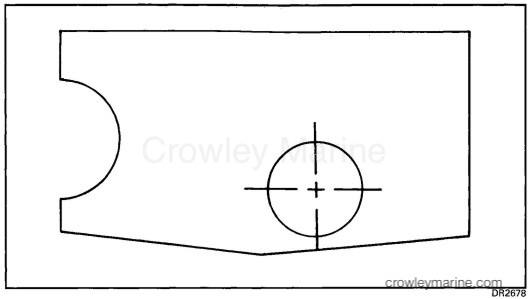 NOTE: All wires must be positioned under clamp (B) and plate (C) in a single layer without twists or crossovers. Position Locating Ring, P/N 334994 over machined bosses on the ignition plate. Apply Ultra Lock™ to the threads of the screws. While pushing ring toward component, hold component against ring and tighten mounting screws to a torque of 30-40 in. lbs. (3.4-4.5 Nm). 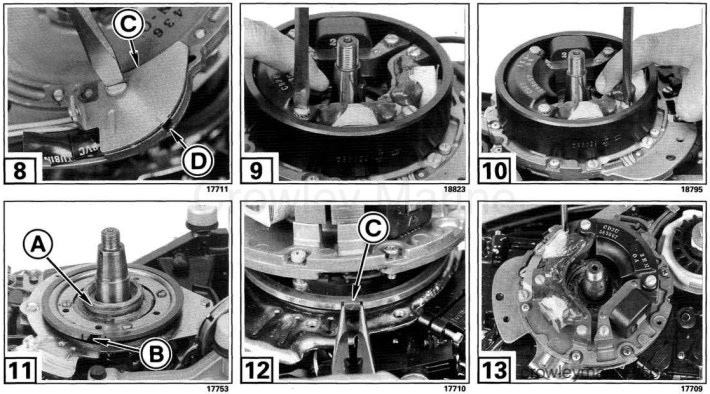 NOTE: Failure to correctly position stator and ignition module could result in damage from contact with flywheel. 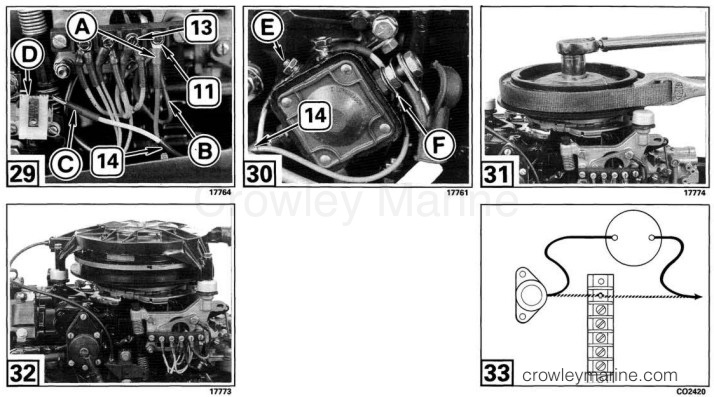 Apply Moly Lube, P/N 174993, to crankcase boss (A), and in groove of ignition plate bearing (B). Apply Ultra Lock to the threads of the five ignition plate screws. Squeeze ends of ignition plate bearing (C) with needle nose pliers in grooves, while guiding ignition plate into position. Align ignition plate with retainer plate. Install and tighten screws to a torque of 25-35 in. lbs. (2.8-4.0 Nm). If an electric start kit is or has been installed, go to page 7: Install Rectifier and Terminal Block, 9.9/15 Models, or page 8: Install Rectifier and Terminal Block, 20 Thru 30 Models. Remove fuel pump screws (A) and remove or push fuel pump down out of the way. Install small grommet (3) into large grommet (4). Install grommet assembly into lower motor cover. Route a pull wire (B) from the starboard side of motor, under carburetor and thru grommet. Attach battery cable (5) to pull wire. Guide the battery cable while pulling it thru the grommet. Pull cable to starboard side of powerhead, and unhook pull wire. Remove any paint from rectifier mounting boss (C). Cut out template DR2678 at back of instruction and tape on front of lower motor cover. Center punch and drill a 5/8 in. (15,8 mm) hole in cover. Remove burrs and sharp edges from hole. Install grommet assembly into hole in motor cover. Guide battery cable (5) while pulling thru grommets. Pull cable to starboard side of motor. Attach rectifier (6) to powerhead with screws (7) and (8), and with star washers (9) and (10) next to the block. For motors without electric start; Place battery cable (5) ground wire (D) and large washer (10) on large screw (8). Insert screw thru rectifier and into block. Install terminal block (11) over rectifier leads with screws (12). Attach rectifier (6) to bracket (A) with screws (7) and (8), and with star washers (9) and (10) next to the bracket. 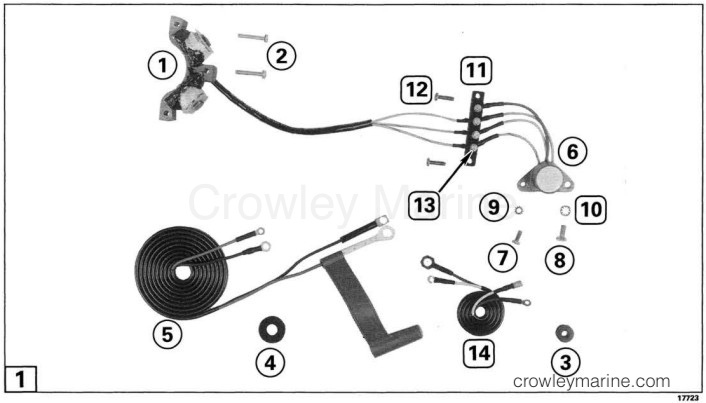 For motors without electric start; Place battery cable (5) ground wire (B) and large washer (10) on large screw (8). Insert screw thru rectifier and into bracket. For motors without electric start; Connect rectifier red wire (C) and battery cable (5) red wire (D) to terminal block (11). For motors with electric start: Connect rectifier red wire (C) and the small terminal red wire (D) from start switch to terminal block (11). Install three rectifier and three stator wires to terminal block matching wire colors codes. Use screws (13). Coat terminals with Black Neoprene Dip, P/N 909570. Reinstall fuel pump and tighten screws (E) securely. Place stator wires in J-clamp (F). Connect rectifier red wire (G) and battery cable (5) red wire (H) to terminal block (11). Remove and discard wire (I) from solenoid control terminal to neutral start switch (wire from electric start kit) if installed. Connect end of red wire with small ring terminal (A) of the two-wire harness (14) and the rectifier red wire (B) to the terminal block (11). Connect the white wire (C) of the two-wire harness to the neutral start switch (D). Route two-wire harness (14) under carburetor to starter solenoid. Remove old white neutral start wire from solenoid control terminal (E), if installed. Connect white wire of harness (14) to same terminal. Coat terminal with Black Neoprene Dip. Connect red wire of harness to solenoid battery terminal (F). Clean crankshaft and flywheel tapers with Cleaning Solvent, P/N 390905. Install flywheel and put Gasket Sealing Compound, P/N 317201, on crankshaft threads. 20 Thru 30 Models: Reinstall manual starter. Check motor timing. See Section 1. - Service Manual. Rotate flywheel. Check for any interference with flywheel. Connect spark plug wires. Run motor in test tank or on boat. Disconnect red rectifier wire. Connect an ammeter (5 amp minimum) between rectifier and battery. Connect battery cables to a battery that is partially discharged. Run motor. Ammeter should read up to 4 amps, depending on battery charge level. Do not smoke or allow sparks or open flames in the area while battery is charging. A charging battery produces highly flammable hydrogen gas fumes which, if ignited, will cause battery to explode.